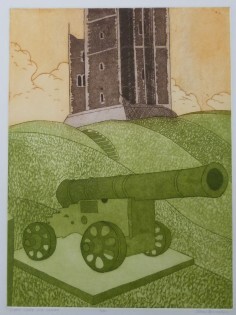 John Reginald Brunsdon (B 1933, D. 2014) ARCA was a British printmaker and painter. He was born in Cheltenham 15 August 1933 and died in Ipswich 13 April 2014. Brunsdon was emphatically not a city dweller, although he is now recording Britain 's heritage, which, by necessity, has brought him in contact with the urban landscape. Nostalgic and evocative images such as The Tower of London (1989), Lambeth Palace (1989), St Mary le Bow Church (1989) and now the Shakespearian Properties, are clear examples. Perhaps nothing could be more quintessentially English than Shakespeare's Birthplace (1990), Anne Hathaway's Cottage (1990), Stratford-upon-Avon and the Heart of England. Country houses such as Longleat House (1989), Waddesdon Manor (1989) and Moor Park Mansion from the Temple of the Winds (1987) are scenes of great lyrical charm which equally possess a powerful sense of genius loci. Ruined abbeys and castles have also found their place in Brunsdon's vision. Brunsdon enrolled at the Cheltenham School of Art in 1945, then under the direction of Stanley Dent, an etcher of some standing who had been taught at the Royal College of Art by Robert Austin. Austin in turn had been instructed by the influential Sir Fran k Short. All three, Short, Austin and Dent had practised the tradition of working direct on the plate from nature. Dent was a lover of rural England and could be seen working at his Gloucestershire locations. Brunsdon, however, never worked directly from nature. His method is to draw and photograph the subject and work out ideas in the studio. 1964 Published The Technique of Etching and Engraving, Batsfords. 1965 Founder member of the Print Makers Council with Michael Rothenstein, Valerie Thornton and others. First one man show at Lund , Sweden . 1966 Birth of his son, Hayden. Visits the Pembrokeshire coast with family. A series of plates are etched and printed on his return. 1967 First one man exhibition in Britain at the Curwen Gallery, London . 1969 Establishes printmaking at St. Albans School of Art with assistance from the Principal, Anthony Harris. Now teaching full-time. 1970 Visits Cumbria for the first time. A series of plates are opened which reflect a greater figurative approach. 1973 At the invitation of David Case he becomes one of the first artists to join Christie's Contemporary Art. With Edward Bawden, David Gentleman and Gerd Winner he is represented in The Daily Telegraph Magazine, November Issue No. 474, The British Landscape, CCA. 1974 Exhibits Fishguard at The Royal Academy Summer Exhibition. 1975 First one exhibition in the United States of America at the Alice Simsar Gallery, Ann Abor, Michigan . 1976 A working holiday in Dorset to draw and take photographs of the landscape for a series of plates. 1977 Moves to Stradbruke, Suffolk . Retires from teaching tu concentrate on etching. 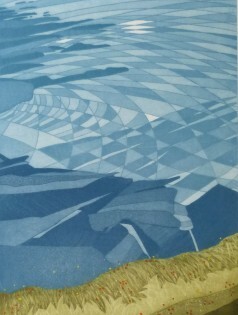 The landscape of Suffolk and Norfolk now features in his work. Also the ancient sites of Stonehenge and Avebury. Commissioned by James Sherwood, Sea Containers, for twelve plates uf Venice for the Hotel Cipriani. A number of commissiuns are established from now on, including the National Trust. 1980 A Dorset landscape is commissioned by the Council for the Protection of Rural Britain . 1981 Takes his father, who is dying of cancer, to Egypt . Visiting the tombs he is astonished to see the similarity between his stylised trees and those of the ancient Egyptians carved in the walls. A series of plates are etched on his return. His work becomes increasingly figurative. 1982 First one man show in Europe at the Galarie L'Angle Aigue, Brussels . 1983 Moves from Stradbroke to an isolated sixteenth century cottage in rural Suffolk . 1984 Visits to Cumbria and Dorset in search of material fur new plates of the landscape. First one man exhibition in Australia at the Chapman Gallery, Canberra . 1987 From now on engaged with recording Britain in association with Contemporary Arts. 1988 One man exhibitions at the City churches of St Mary Le Bow and St Catherine Cree, London . 1989 The Tower of London painting represented on the front cover of Spring edition of The Illustrated London News. A series of plates showing London from the Thames are etched. Also, Waddesdon Manor for the National Trust, Longleat House for the Marquess of Bath and a series fur the Helmsley Heritage Trust. A working holiday to Lyme Regis with Ibby Saunders and Peter Rumley . One man exhibition at Heffers Gallery, Cambridge . 1990 The Shakespeare Birthplace Trust plates of nineteen views represents the largest commission he has undertaken to date.